Living in North Carolina, we are lucky that for most of winter, we can still find green, growing things. Knowing that there are still things I can pick and eat from my yard, garden, or beyond is always a helpful reminder that things keep growing even when the world seems somewhat stagnant. The key is looking under your feet, rather than up at the trees at this time of year! For those of you interested in trying to forage, but not so sure about going any further than your own backyard, this post is for you! Because these greens are readily available through winter, they are a great topic for our Feasting in Times of Winter Scarcity series. These are my two favorite winter greens to forage in my own yard (although I often find even bigger, juicier specimens if I am willing to branch out a little further to greenways, etc.). The two greens below also make a well-balanced mix with contrasting, yet complimentary flavors, perfect for winter salads! IMPORTANT SIDE NOTE: This is a good point to stress that (although these two plants are very easy to identify) you should NOT eat any plant before you have positively identified it with a good plant guide (we recommend A Field Guide to Edible Wild Plants: Eastern and central North America (Peterson Field Guides) ). The first time you eat it, it is best to only have a small amount so that you can be sure you do not have any adverse effects from it (which is probably a good idea with any food you are trying for the first time, even off a grocery store shelf!). 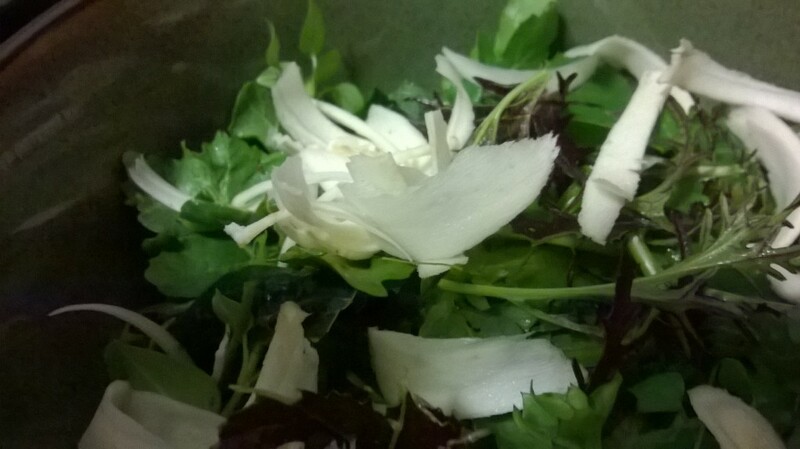 Without any further delay… I introduce to you, chickweed and wild cress! 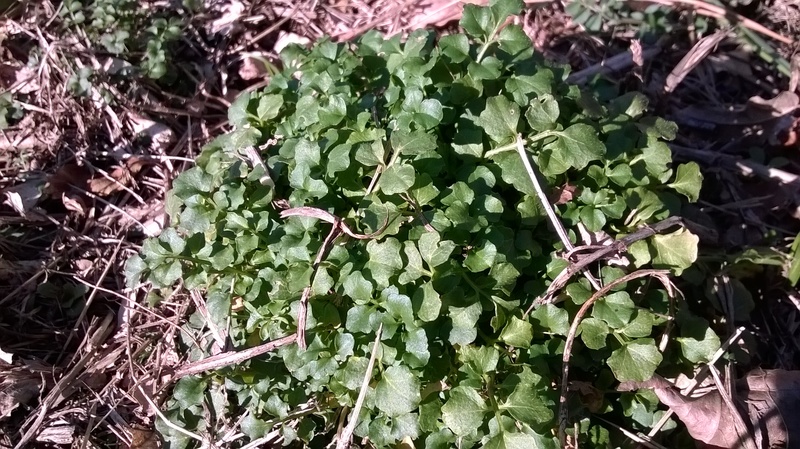 Chickweed will grow *almost* year-long in North Carolina, shriveling down to almost nothing in the hottest part of the summer, but then returning in fall and through the winter only to completely take over your flower beds seemingly overnight in the early spring. Description and Habitat: Chickweed grows low to the ground with trailing stems coming out from a single middle point. The stems are covered in small, heart-shaped leaves, and small white flowers eventually bloom on the tips. It likes damp, cool areas, but will grow just about anywhere. Harvest: If you want to be able to continuously come back to the same patch, it pays to snip off tips rather than pull the whole plant. If you can identify the center of the spider-like clump, you can often gather the trailing stems up like a ponytail and then snip them all off at once. Alternatively, you can give it a more delicate haircut, snipping tips one at a time. Flavor and Use: I find the flavor to be very mild and green, almost like the flavor of corn or corn silks. The texture offers a nice delicate crunch in salads, and the mild flavor can offset those of many of the stronger tasting greens available this time of year (such as kale, arugula, mustards, or our next featured green below). It can also be sautéed in oil or butter, blended into soups, or chopped and added to soups to brighten them up right at the end of cooking. This is actually the best time to harvest wild cress (as long as it’s not buried under snow). It has a very short season in the cool weather before it bolts with the first sign of warm weather, sending up a flower shoot and with it all the energy and tastiness out of its little leaves. Description and Habitat: Like chickweed, wild cress prefers a somewhat damp and cool environment (which is almost everywhere at this time of year). It will grow in a small clump with leaves all radiating out from a central point. The leaves are each little fronds of multiple smaller leaflets, almost like a mini-arugula leaf. When warm weather comes, it will send up a flower shoot with small white flower clusters at which point there’s not much left in the leaf department. If in doubt about its identification, chew on a small piece of leaf, and it should give you a spicy, arugula-like flavor. Harvest: Again, if you want to preserve your source, you should avoid pulling up the whole plant. You can either snip leaves individually haircut style, or try to gather the leaves like a pony tail and cut off a large clump. Flavor and Use: This little leaf packs a more powerful punch! Like its relatives in the mustard family, such as water cress or arugula, it will have a more spicy, peppery taste. 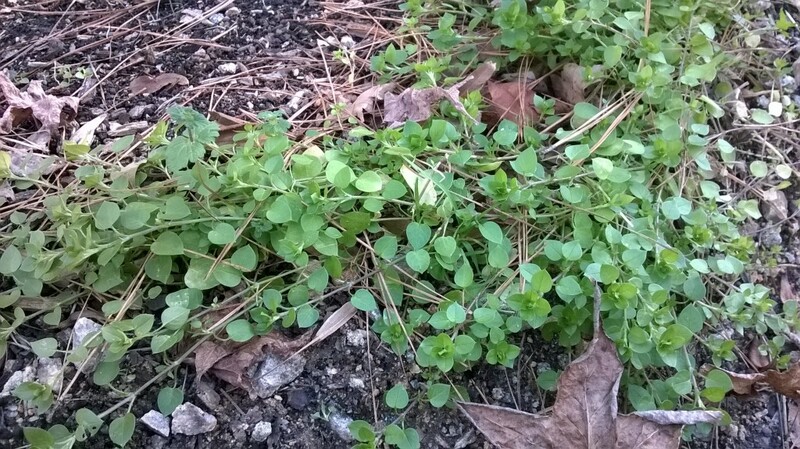 I like it in salads mixed with more mild greens, like chickweed (above). Also, similar to chickweed, it’s good blended in soups or chopped up and added to them at the finish of cooking. You could try sautéing it, but because the leaves are so tiny, it would take quite a pile to have anything left once they are all wilted down! So what is the point of going through all the trouble of seeking these out rather than going and buying a bag of lettuce at the grocery store? Well, for one thing, they’re tasty! They’re also free. They’re local and sustainable (no packaging, no synthetic fertilizers or pesticides, no transport!). And finally, they’re just a whole heck of a lot more interesting! By doing this, we can tap into traditions and knowledge from generations of people who came before us who placed a high value on green, growing things in times of scarcity. These greens were valued because they were some of the only fresh things available at this time of year – full of important nutrients. Even before the words vitamin or antioxidant existed, the connection between health, vitality, and fresh green things existed beyond any specific nutritional knowledge. Our bodies crave this freshness after long, cold months without them. Tap into the traditions of generations that have come before you and incorporate some wild greens into your salad (or soup) this winter! See our Resources Page for more recommendations on our favorite foraging guides! Ava Chin of Eating Wildly also states that wild vegetables are higher in phytonutrients, aka antioxidants, than cultivated veggies. Another good reason to try foraging. Thanks for putting the warning regarding proper plant ID. A good reminder to be conscious of what we are eating. PS – this is a great piece on this idea: http://www.npr.org/blogs/thesalt/2013/07/10/195592468/eating-on-the-wild-side-a-field-guide-to-nutritious-food I need to get her book!